Clearly Tahoe's Geoff Miller, left, and Kelsey Weist are making things clear with the launch of their clear kayak rental service. Lake Tahoe’s clarity is one of its hallmark features and something locals strive to preserve. 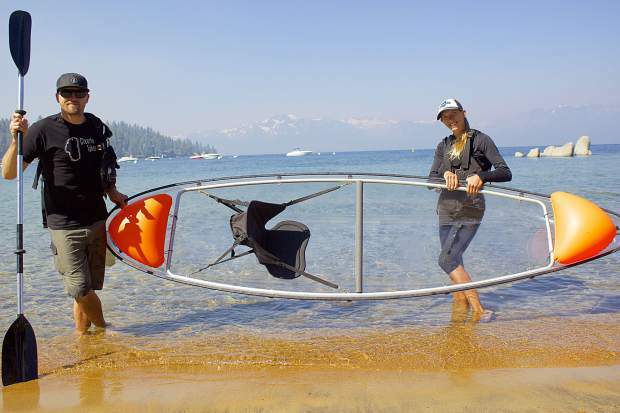 Geoff Miller and Kelsey Weist, proprietors of local kayak rental service, Clearly Tahoe, developed a way to combine fun, appreciating the lake’s clarity and aiding in preservation. Since last year, the couple has been renting polycarbonate kayaks that are completely transparent, allowing for some unique viewing of the lake. Clearly Tahoe also equips each kayak with a book of flash cards that help identify invasive species, encouraging their customers to use and log anything they see. Miller and Weist say they’ve been spending time on the water most of their lives, doing anything from kayaking to scuba diving and snorkeling, but wanted to bring something to Lake Tahoe that would allow for cool views, without having to be submerged in the chilly water. 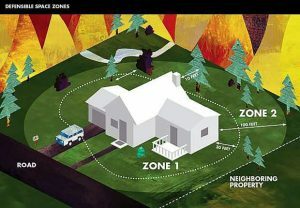 As of now, Clearly Tahoe doesn’t offer rentals from a centralized, beachside location, but does schedule private rentals and guided tours through its website. Miller said when he first thought about what it would be like to paddle a clear kayak, he didn’t even know if they existed. According to Weist and Miller, the kayaks aren’t designed for speed and maneuvering, like a typical sit-in kayak, but use is mostly meant for slower-placed, scenic touring. There is a significant amount of work that comes with keeping the kayaks in top shape, but having a crystal clear kayak in the end is the payoff. Weist also explained there are certain areas the kayaks wouldn’t be ideal due to varying levels of clarity. Weist and Miller have also been using their business as a tool to keep the lake clear. Miller said they’ve been pretty successful in educating a lot of their customers and several have come back in after kayaking to report some things they saw. Clearly Tahoe usually operates during the warm months and say they will probably wrap up operations by September or October. Their rentals start at $85 for two hours and discounts are available for additional kayaks added to a group. 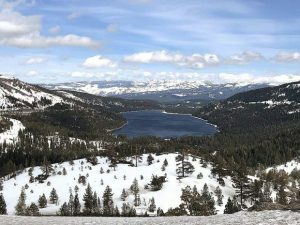 For information on kayaks, rentals and guided tours, visit clearlytahoe.com or call (530) 554-4664.